The Eaze interface lets you know how long it’s going to take, with the steps to delivery checked off, in turn: “order received,” “order is being prepared,” “driver is on the way” and “order is arriving,” with the courier texting the progress along the way until they’re at your front door. With the company’s boast of a 15- to 20-minute delivery, I was a little disheartened when it showed a wait time of 48 to 56 minutes, but I suppose that’s what you get when you order at 4:30 p.m. smack in the middle of L.A. rush hour. I imagine it’s a lot different in a Sacramento suburb on a lazy Sunday afternoon. Still, my Eaze courier arrived at precisely the moment the clock struck zero. I buzzed him up on my apartment intercom and had three pre-rolls in my hand in a compliant, child-proof package after signing my name on his iPhone. And while there was no room for a tip, I gave the guy $10 in cash. My deliverer seemed genuinely grateful. California’s come a long way from the bicycle-riding pot delivery service depicted in HBO’s High Maintenance. Thanks to Eaze and other services, that dream is now a reality, at least in Cali. The San Francisco-based company was founded in 2014 by since-departed tech entrepreneur Keith McCarty, who used the money from selling start-up Yammer, a social media enterprise, to Microsoft for $1.2 billion. McCarty, a Christian conservative from Orange County who doesn’t partake himself, was looking for a business for his on-demand technology. McCarty, who has since been replaced as CEO by his Yammer colleague Jim Patterson, was intent on getting medical marijuana patients—at the time, the only ones who could legally consume—their required medicine without any hassles. Just use the Eaze app on your photo for canna-deliveries. With adult use now legal in California and eight other states at press time, Eaze has grown exponentially, adding offices in Venice and San Diego and affiliations with 12 individual licensed dispensary warehouses in Los Angeles, San Francisco, Sacramento, Oakland, San Jose, Napa and Santa Rosa. Those individual distribution centers, most of them not connected to a dispensary, in turn employ upwards of 1,000 drivers (with W2s and on payroll) all connected by Eaze’s licensed software. Many of the cars are stocked with a variety of securely packaged, child-proof exit bags in complete compliance with regulations. Marijuana delivery services are nothing new. Companies like Postmates make cannabis deliveries, but they involve third-parties and often take more than an hour. Many dispensaries offer their own delivery, frequently with white-label (nonbranded) partners. With more companies receiving licenses from the state for delivery, there’s been pushback. In October, several San Diego weed couriers were busted for not having proper licenses, including Leaf Life, with 50 pounds of product and $2,500 seized, and Fast Grass, where 30 pounds of weed was taken, along with four pounds of meth and $1,800 in cash. Since the beginning of the year through September in Los Angeles alone, 515 people were arrested, representing 101 illegal delivery services. There’s been a great deal of pressure from a coalition of police, city governments and retail dispensaries on the California Bureau of Cannabis Control to ban deliveries altogether. Eaze also offers clients—distributors and brands—the benefits of its expertise on compliance and the regulations for each local area. “We’re the policy-maker’s trusted credible friends,” Shiravi adds. “We work with them to offer safe access for consumers with the most seamless technology.” Distributors pay an annual licensing fee for Eaze’s technology based on their size and traffic. There’s been a great deal of pressure from a coalition of police, city governments and retail dispensaries on the California Bureau of Cannabis Control to ban marijuana deliveries altogether. 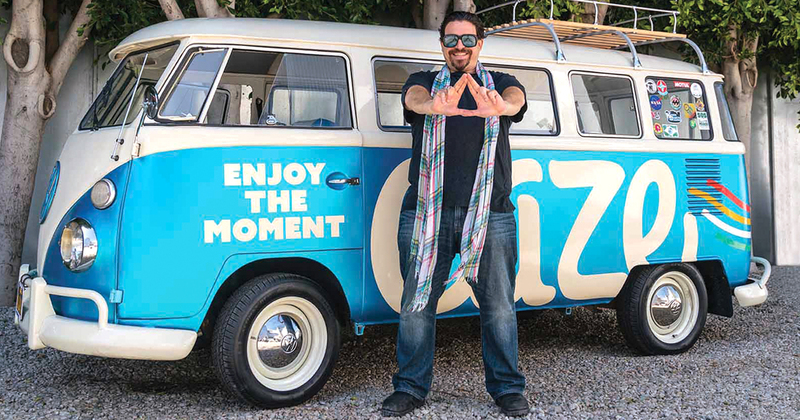 Shiravi points to Eaze Insights—a database that provides valuable information on consumer behavior—and a three-pillar plan that addresses economic empowerment, social outreach and community sustainability in association with companies like The Hood Incubator and Success Center in the San Francisco Bay Area, which target those who’ve been most negatively impacted by the War on Drugs. The goal is to train people for entrepreneurial roles within the emerging cannabis economy. EazeMD was launched to help patients secure medical cards by connecting them with doctors via an online video chat. 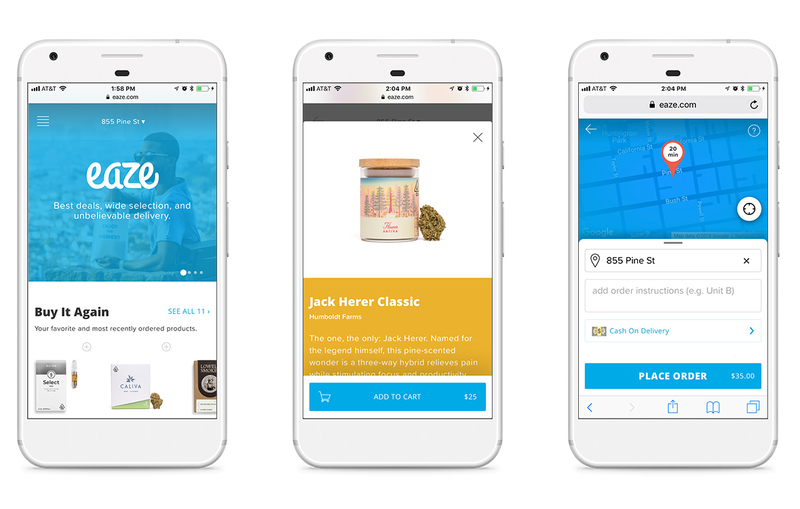 Eaze has also been active in compassionate-care initiatives by calling on brands to donate products, as well as supporting local political agendas, including the expungement of criminal records for marijuana-related offenses. An Eaze promo for its delivery service. In California, cannabis delivery is here to stay. Whether Eaze will turn out to be the dominant player remains to be seen, but they’re the most high-profile entry so far, complete with $52 million raised from investors since its start-up, including Series A funding from the Snoop Dogg-backed Casa Verde Capital, as well as the likes of Bailey Capital, DCM Ventures, Kaya Ventures and FJ Labs. According to Forbes, Eaze is “the highest-funded start-up in the history of the cannabis industry, as well as the fastest-growing one,” with 300% growth in 2017 from the previous year. Last year, the company reported it had performed 120,000 deliveries per month to 250,000 users. “One day soon we’ll have more cannabis delivery drivers on the road than Domino’s Pizza,” predicts dispensary owner Dr. Dina Browner, who owns Alternative Herbal Health Services in West Hollywood. Now if only they’d fix the potholes, too. The post Eaze Delivers: California Firm Brings Cannabis to Your Doorstep appeared first on Freedom Leaf.